recruitment 2018 notification. Written exam will be conducted for this CMD KRFB Sweeper, Office Attendant Recruitment 2018. Online application last date for this KRFB vacancies is 13-12-2018. Apply online at www.cmdkerala.net for this KRFB Recruitment 2018. 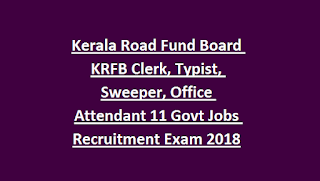 Detailed information of Kerala Road Fund Board recruitment 2018 age limits, salary, qualification and number of posts is updated below. 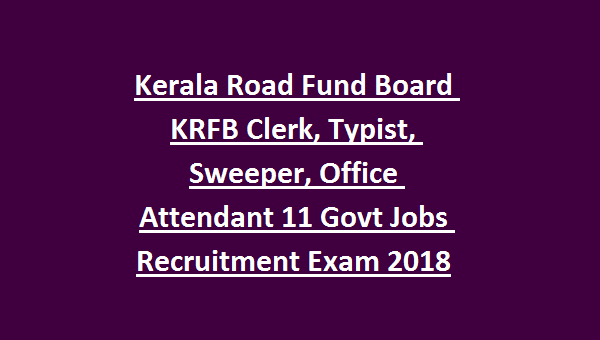 There are total 11 vacancies in this Kerala Road Fund Board recruitment 2018. Upper age limit is 50 years for Project Coordinator jobs. For all other posts upper age limit is 36 years. Age limits cut off date is 01-11-2018. For other posts experience is not required. Selection will be based on Kerala Road Fund Board jobs will be based on qualifying exam marks and interview. Apply online for this KRFB vacancies through official website of www.cmdkerala.net. Last date to apply online is 13-12-2018.